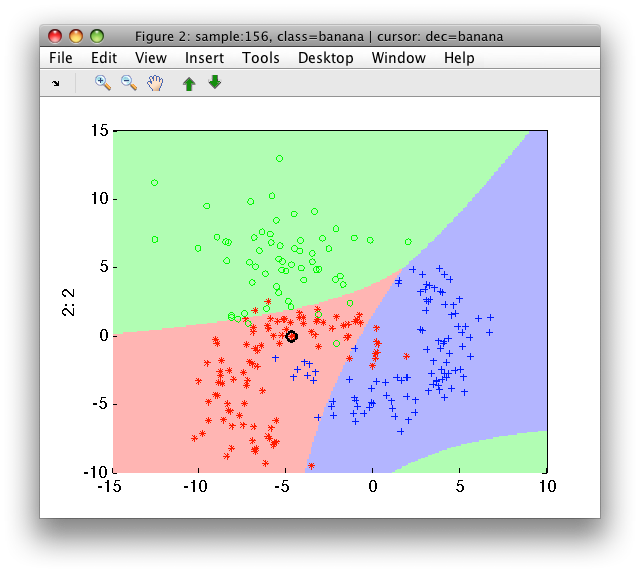 Discriminant is a classifier that directly separates the classes instead of modeling them. Providing only class distinction, discriminants cannot be used for detection. Fisher discriminant sdfisher performs linear discriminant analysis extraction (LDA) with sdlda to find an informative subspace where the classes are well separated. The dimensionality of the resulting subspace is typically the number of classes - 1. In this subspace, sdfisher trains a linear classifier assuming normal densities. In this way, we obtain a general solution that is applicable to any number of classes. The Fisher discriminant is very similar to liner discriminant assuming normal densities sdlinear, although it does not use explicit assumption of normality but only second order statistics. 2 Gaussian model          2x3  single cov.mat. Although Fisher discriminant can be trained on problems with small number of samples and large number of features (even with more features than samples), this often yields over-training. The resulting classifier shows high performance on the training set but fails to generalize on the test set. 3 Gaussian model          2x3  single cov.mat. The least-mean square classifier performs linear regression on numerical representation of class labels. The p2 classifier considers 'banana' class more important than 'apple' or 'stone'. The sdlms may also be used to regress arbitrary user-defined numerical targets. The soft outputs of sdlms then provide resulting linear regression predictions. Note that, when used for regression, sdlms does return soft outputs. 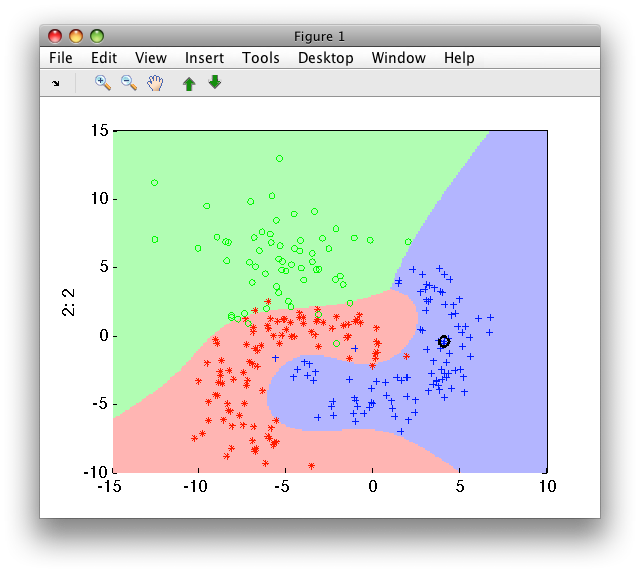 sdlogistic implements a classifier based on logistic regression. By default, it builds a single direct multi-class model which is non-linear due to polynomial feature space expansion step. In the example above, the input 2D feature space is expanded using 3rd degree polynomial terms to 7D space. In this space, scaling is applied and logistic classifier is trained. Optimization of the logistic classifier is performed using gradient descent algorithm. It may be influenced by changing number of iterations and optimization step. The number of iterations is changed by 'iters' option. By default, 10000 iterations are performed. 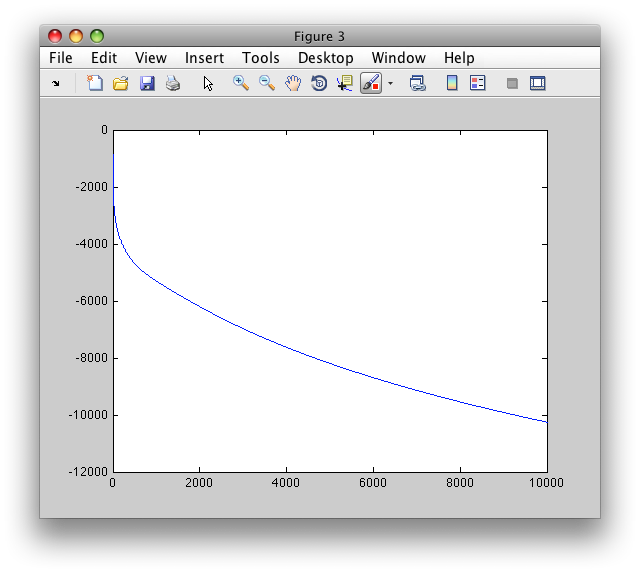 The plot shows log-likelihood development over the 10000 iterations. The lower the value the better fit of the model to data.